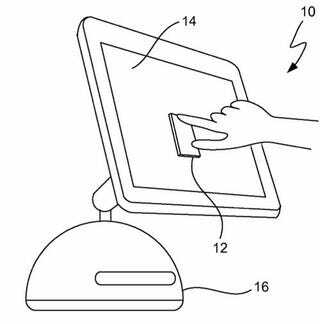 In 2004 Apple patent app that was recently filed for continuation describes a touchscreen iMac that recognizes shapes, allowing you to interact with your computer as you might a toddler's geometric puzzle. The pattern 122 may be any shape whether simple or complex. Some examples of patterns include circles, squares, triangles, dots, dashes, coat of arms, logos, symbols, text and the like. Other examples include binary patterns and Braille symbols. The pattern may be related to the action to be performed. For example, the pattern may be in the form of a conventional key for actions associated with gaining access to restricted areas, or in the form of a light bulb for actions associated with turning a light on and off. In some cases, the signet pattern may include an alignment mark for helping determine the orientation of the signet pattern relative to the touch screen, i.e., helps the pattern recognizer to determine orientation. The alignment mark may for example be a cross that helps distinguish the pattern relative to an x and y coordinate system. As should be appreciated, simple shapes are more easily counterfeited and thus complex shape may be desired. For example, a large circle may be relatively easy to counterfeit, whereas a complex series of dots may harder to counterfeit. While at first the idea certainly sounds clever, the simple fact that car keys are a lot easier to lose than computer passwords is enough to temper any excitement over such a possibility.